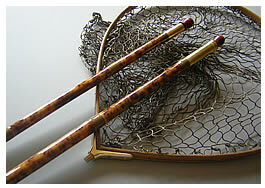 Ash framed landing nets are made from seasoned ash which I cut only using straight grained strips. The edges are rounded and smoothed and a channel is then cut through the centre. The mesh is knotless and has fifty loops and has a drop of 30 inches but can be made longer if required. Once the channel in the frame has been cut, it is then drilled at equal spaces, fifty holes in all, this then allows the fifty loops to be pulled through the pre-drilled holes, one at a time. Before the net can be secured, the ash frame will go through a series of procedures. Firstly the ash strip will be steam treated to soften the natural resins, this makes the ash strip pliable enough to bend confidently. It is then placed and secured on a former, which is made to the shape that the ash frame needs to be. This is left to dry out and cure and may take several weeks. Once the drying out period is over, the ash frame can be removed from the former and will remain in the desired shape. It is then placed in an impregnation tank to seal and protect the timber from the elements. This impregnation period can take about a week and once complete, it is then ready to be dried and polished. Once the frame has been smoothed and polished by hand it is then ready to have the net attached to the frame. A strong cord is then sown through all the loops and then they are pulled tight against the cord which runs the whole length of the channel. This secured the net is very much like the mesh in a tennis racket. The mesh it self is white to begin with and then dyed to my own shade of green or brown. 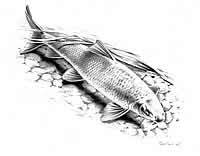 This particular net is built with general coarse fishing in mind and has proved popular over the years. This net is also built using seasoned ash and goes through the same techniques as the Deluxe version except the ash frame is left plain and not sown in to a pre-cut channel. The plain ash frame has the net looped over the frame, rather than sown in. 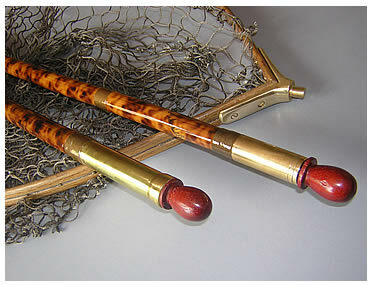 These are made from good quality bamboo which is heat treated and straightened. They come in a variety of finishes and lengths, the most popular being 5ft 6ins and pattern flame-toned. 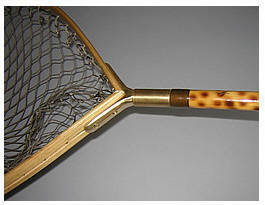 The End Cap is turned brass and the brass threaded head for the net is a standard 3/8 BSF. The bamboo handle can be either plain bamboo or pattern flame-toned and finished in a gloss varnish and inscribed in neat Indian ink.